The agency plans to provide observation decks on the property where the public can view endangered manatees. It’s been a long time coming, but it looks like Three Sisters Springs has finally been saved. The fate of the deal was assured on Monday, July 12, 2010, when Crystal River City Council members voted unanimously to accept joint ownership of the Three Sisters Springs property, along with the South Florida Water Management District. The property will be managed by the U.S. Fish and Wildlife Service and included as part of the Crystal River National Wildlife Refuge. The agency plans to provide observation decks on the property where the public can view endangered manatees. 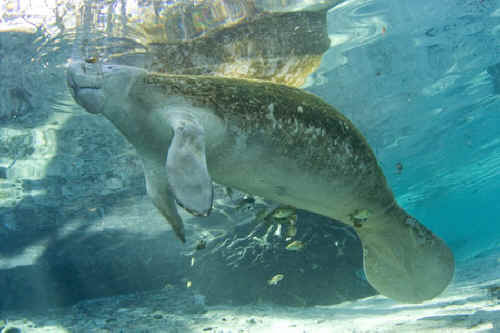 The Three Sisters Springs parcel, which abuts two manatee sanctuaries in Kings Bay in Crystal River, Florida, is a crucial land purchase for the protection of manatees and other wildlife. The springs are one of the natural wonders that make Florida so special, and they provide one of the most important manatee warm water refuges on Florida's west coast. Protecting Three Sisters Springs has long been a dream for Helen Spivey, Crystal River resident and Co-Chair of Save the Manatee Club’s Board of Directors. Representing the Club at the council meeting, she said, "We have been strong partners through this, and we would like to remain strong partners to the city, U.S. Fish and Wildlife Service, and the Southwest Water Management District." Then, speaking in turn to each of the three council members, and to applause from the packed house, Spivey continued, "You have always done the right thing where this is concerned, and I know you will do the right thing tonight, so I would just like to say thank you, thank you, thank you." Often described as “an environmental jewel,” Three Sisters Springs are blue oases of clear and pristine water located in the heart of Crystal River, Florida. Up to now, the land around the springs has been privately owned, and the springs attract large numbers of boaters, divers, snorkelers, and swimmers each year, many of whom came to see the manatees using the warm water springs as a refuge in the winter. Purchasing the property to protect the manatees’ habitat and opening it to public access has been a longtime goal of local residents and environmentalists. In 2005, Tampa businessman Hal Flowers and a group of investors purchased the 57-acre Three Sisters property for $10.5 million, planning to create a 300-house waterfront development. However, Flowers was moved to protect the springs after helping to rescue a young manatee injured by a boat hit there in 2008. The manatee, named Baby Sister, survived, and Flowers decided to offer the property for public purchase. Flowers’ offer to sell the Three Sisters land for $11.8 million spurred a huge drive to raise funds and drum up support for the purchase of the property. The Crystal River City Council took the first step by applying for a grant from the Florida Communities Trust (FCT), a state land acquisition grant program funded by Florida Forever proceeds. But the FCT grant required nearly $3 million in matching funds, which have been supplied from a variety of sources ranging from a nearly $2 million grant from the Felburn Foundation, $200,000 from the Citrus County Commission and $100,000 donations from the City of Crystal River and the Citrus County Tourist Development Council, to smaller donations from private residents. Dr. Paresh Desai, a former board member of Save the Manatee Club, contributed $10,000 to help save the springs, and many Save the Manatee Club supporters and Citrus County residents contributed individual donations. U.S. Senator Bill Nelson and Representatives Ginny Brown-Waite and Debbie Wasserman-Schultz were also instrumental in securing $1.5 million from the Interior Department’s land acquisition fund for the Three Sisters purchase. In June of this year, the Southwest Florida Water Management District elected to contribute $1.3 million for the project. Florida State Senator Charlie Dean and State Representative Ron Schultz then added the FCT line item to the state budget, and Governor Charlie Crist accepted it, paving the way for the purchase of the land. Twice, a large group of supporters, including Spivey and Save the Manatee Club Executive Director Patrick Rose, traveled to Tallahassee to show support for the Three Sisters purchase to the FCT Governing Board, and many Save the Manatee Club supporters, Citrus County residents, and other individuals wrote thousands of letters and emails in favor of the project. Performers from across Florida even donated time, talent, and expenses for “Concert on the Point,” a fundraiser to help save Three Sisters. In the end, the fundraising efforts came up about $1 million short, but earlier this month, Flowers and his partners agreed to accept an offer for the original purchase price of $10.5 million, and the closing is scheduled for the end of July. “It takes a village to pull this off,” said Lace Blue-McLean, President of the Friends of Chassahowitzka National Wildlife Refuge, who, along with City Manager Andy Houston, helped spearhead the effort to save the springs. In the end, federal, state, and local government, private foundations, businesses, nonprofit organizations, and individuals all turned out to give funds and show their support for saving Three Sisters. 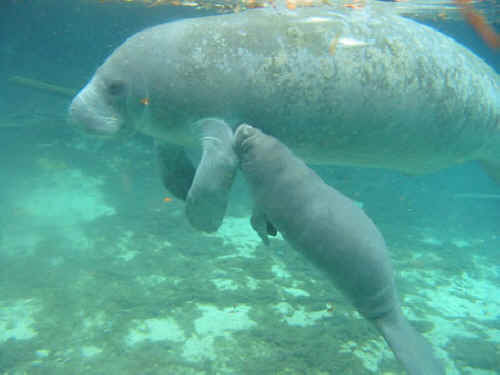 A manatee mother nurses her calf at Three Sisters Springs.